Feevale University has been having partnership with Finnish educational institutions for 12 years. An important step to deepen this process occurred this month, when a meeting marked the completion of the improvement program based on the methodologies developed in the Nordic country. The five teachers selected in an internal notice of the international program Teaching and Learning in Higher Education met with Jarkko Wickström, Director of Operations for Brazil and Latin America of Finland University, a consortium that brings together some of the country's main educational institutions: Eastern University Finland, University of Tampere, University of Turku and Åbo Akademi University. The notice provides for the training of teachers interested in developing or expanding individual and collective pedagogical skills. The agreement signed in September this year with Finland University focuses on advances in educational projects and innovative practices, providing for the preparation of teachers so that they can adopt methodologies and working technologies of Finnish institutions. A set of actions focused on staff development and teaching and research projects is planned.” Our partnership with Finland is to change the concept of the teaching issue at Feevale at all levels,"says Feevale Rector , Cleber Prodanov. "The center of the process is the student and their relationship with the teacher and this will impact all our actions." 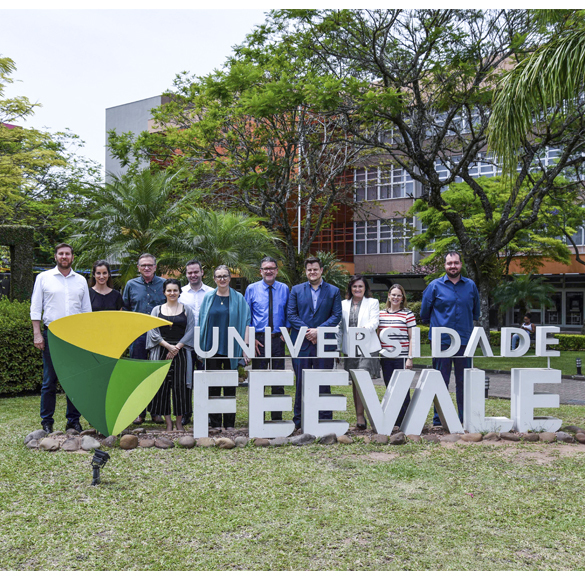 In Brasil, Feevale was the pioneer in the relationship with universities in Finland: in 2006 with Häme University of Applied Sciences (Hamk) and in 2008 with University of Tampere. Signed another agreement in 2012 with VIA University College, Denmark. The intensification of the relationship among these institutions led in 2016 to a trilateral agreement, Beyond: Alliance for Knowledge (BAK). The main objective of this alliance is to expand actions for international education, integrating research groups and internationalizing companies linked to the technology parks of partner universities, among other cooperation actions. "Our relationship with Finland is a process that has been growing with joint projects and research," recalls Prodanov. "What we will increase now is the use of what Finland has the best, which is its educational process. We are going to use that in the teacher training, because talking about Finland means talking about educational quality. " The process of teacher training at Feevale, as a result of the agreement with Finland University, begins with Manuela Albornoz Gonçalves, Marco Antônio Mabília Martins, Marina Seibert Cezar, Paula Luce Bohrer and Roberto Affonso Schilling. Between March and September of next year, these teachers will have classes taught by Finns in São Paulo and also in the distance modality. In the sequence, there will be an internal multiplication of that knowledge. The partnership also aims the execution of special projects and the creation of joint graduate programs lato sensu e stricto sensu. International rankings that measure quality of education among several countries place Finland at the top, at all levels of education. This recognition is the result of investments and methodologies developed at least 160 years ago, when Uno Cygnaeus (1810-1888) created the Finnish public educational system. He set his own methodology, after traveling to several countries to know what was best in educational proposals. Some of the principles advocated by Cygnaeus were the secular character of the schools and the creation of a faculty for teacher training, which began in 1862. Finland's natural resources were water, wood and cold, said Wickström. With the structuring of the educational system, a school was set up every 15 kilometers in rural areas. In 1969, there was a major reform, which established equality as a principle and two obligations: every citizen should study until the ninth year and every teacher must have a master's degree. A specific didactics was also created for each subject, as a result of researches developed for this purpose. The country's continuing investment in education was highlighted by the Programme for International Student Assessment (Pisa), established in 2000, which targets school performance every three years: Finland won the first three editions and the third place in 2009. This aroused a great interest in the country's education. For Wickström, stable economy and development result from investment in education. Graphs presented by the executive indicated that the growing investment curve in universities has a parallel in economic development. "We need to make sure everyone has access and equality," he said. "The spirit of competition and standardization do not work." He defined Finland's educational recipe on the following points: responsibility based on trust; professionalism ("teacher who knows about education"); cooperation between teachers and schools; controlled risks; to test new things. "We can sum up in work, continuity, risk and experimentation," Wickström said. He emphasized that practice-based research is an important tool for teachers, especially in basic education. "Everything we do is based on research conducted by universities." At the meeting with Feevale's five professors, Wickström introduced Finland University, a consortium that shares the well-established and consolidated educational practices that have given the country recognition for the implementation of some of the major pillars of education in the 21st century. There are forty universities in the country. The so-called scientific universities are fourteen structured by the research and covering all areas of knowledge at the most diverse levels, including postdoctoral stages. The other 26 are focused on applied sciences. All universities are public and offer five years of study, three are dedicated to full-time undergraduate courses and two to master's degrees. The applied sciences universities are responsible for the pedagogical training of teachers from primary to higher education. Between the late 1980s and early 1990s, Finnish universities began to practice academic mobility. In the current phase of internationalization, they are interested in cooperation based not only on student exchange, but also on teacher training and the creation of undergraduate and postgraduate courses. "We want strategic partnerships in Brazil," says Wickström. He pointed out that the birth rate in Finland is very low, so the opening of universities to the world becomes strategic to prevent institutions from becoming idle. About Finland's international expansion process in the field of education, Wickström pointed out five areas in which the country has the best global knowledge to offer: information and communication technologies (ICTs), teacher training, health, environmental sciences and public administration. The institutions that make up Finland University offer 67 master’s degree courses whose classes are in English. Wickström points that this is necessary because of the difficulty of learning Finnish. If language is not considered, the offer jumps to around 700. Concerning to specialization courses (lato sensu), there are a multitude of possibilities that arise from these five areas, structured in a hybrid mode, with face-to-face and distance classes. "Feevale is an international university with a qualified network of partners in 27 countries. Among them, Finland is in the first place with joint cooperation actions in innovative programs for environmental quality, renewable energy, health and wellness, creative industry, smart services, strategic management and others", says Feevale Director of International and Institutional Affairs, Paula Casari Cundari.